I stumbled upon an old school building in the center of Amsterdam and it was there I discovered an old attic that evoked such a strong emotion inside of me. It was cold and abandoned, with an aged crucifix that hung on one of the walls. The scene was incredibly surreal, as was the whole experience. And from this came the inspiration for my concept, I simply had to create something in this space. 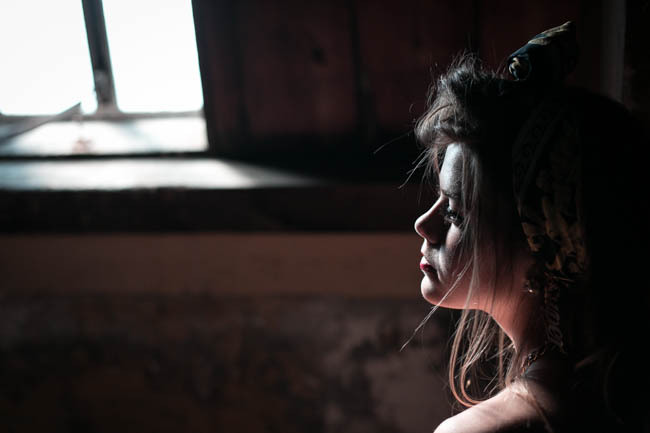 The inspiration that came to me within this dark, abandoned attic was the story of a woman from the 1950s, which was told through a series of surreal fashion photographs. I wanted to convey the feeling of being in a temporal, transitional state, and of the subject looking back reminiscently on her life. I had a very compelling concept and a great story, and what I specifically needed to thread it all together was equally compelling lighting. It so happened that the attic space was naturally lit by sunlight streaming in through several large windows that were spaced quite some distance apart. This was very fortunate for me, as the light fell off quite drastically and added a unique sense of drama. 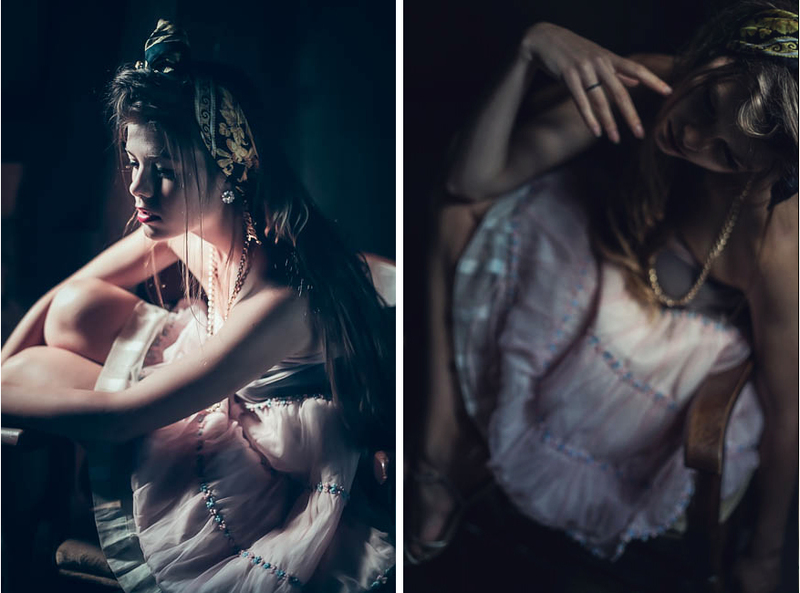 At the same time, the intensity and lighting effects changed constantly throughout the day, further adding an element of unpredictability to my surreal fashion shoot. I had the lighting I needed to make this concept work. 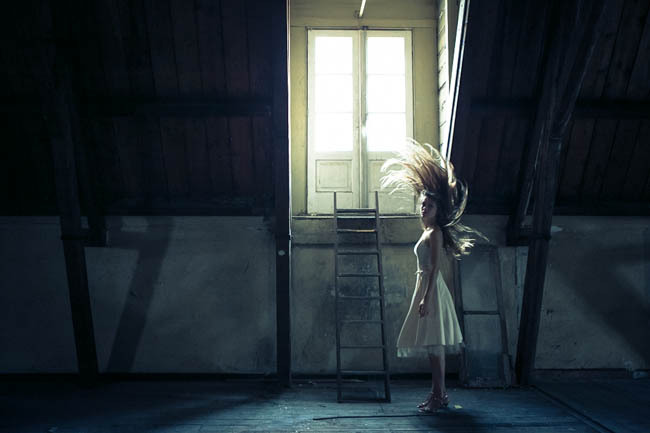 The “Girl in the Attic” photo shoot produced many striking images. 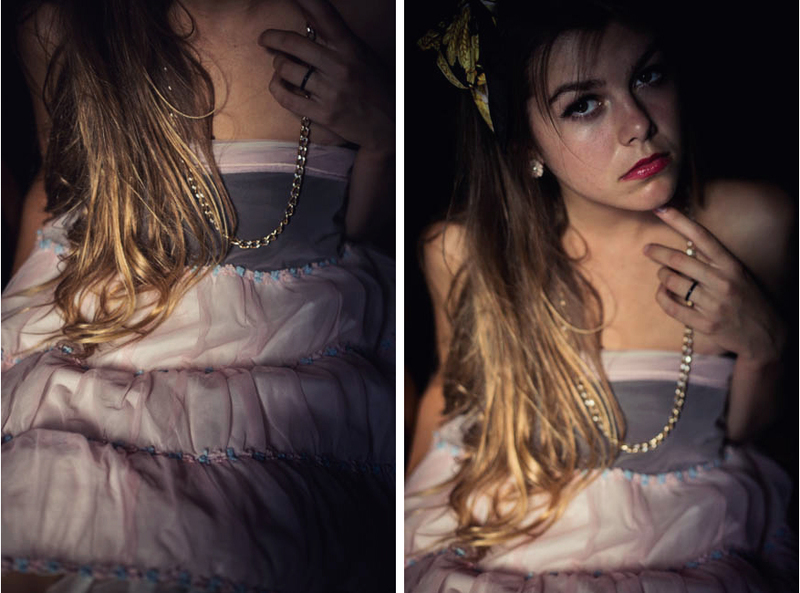 The final pictures I selected for this series tended to be dark and surreal, but they also seemed to effectively merge together elements from different eras and describe the story I had in my head. In the end, I believe the series successfully reveals the accumulated energy of this attic by connecting my images to the feeling I first had when entering the space. The lighting was very important for reproducing the emotion, while the styling and the haunting beauty of our model completed the scene.